February's Art Elements Challenge sponsored by Cathy Spivey Mendola is birds of prey. I am very fond using owls in my jewelry and this bird happens to be an excellent hunter in both the day and night which makes the owl perfect for this challenge. 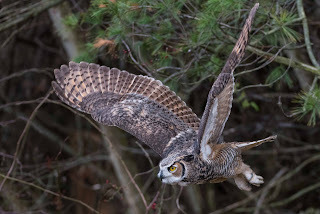 I love watching owls fly as they move stealthy when looking for their prey. 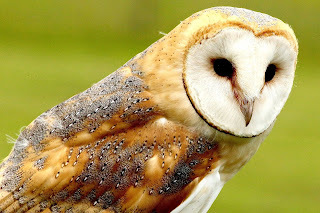 Their prey includes invertebrates such as insects, spiders, earthworms, snails and crabs. Fish, reptiles, amphibians, birds and small mammals are also part of the owl diet. Earlier in the month, I blogged about this leather owl bracelet with a magnetic clasp. I designed a single strand leather bracelet using 10 mm. flat Italian leather. This leather reminded me of tree bark. 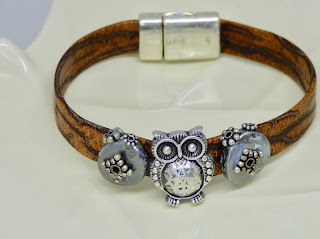 I love owls so I couldn't resist an owl slider that seemed a natural fit with the leather. I used a silver magnetic clasp. 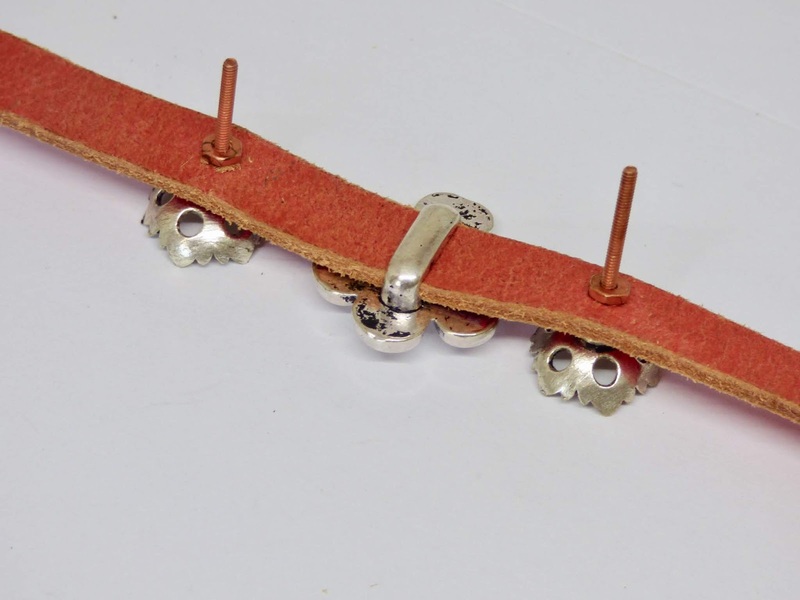 To put my spin on the bracelet, I used Super glue to attach metal spacers to two beads that I had in my stash and then glued the beads to the leather. I love the fun look! 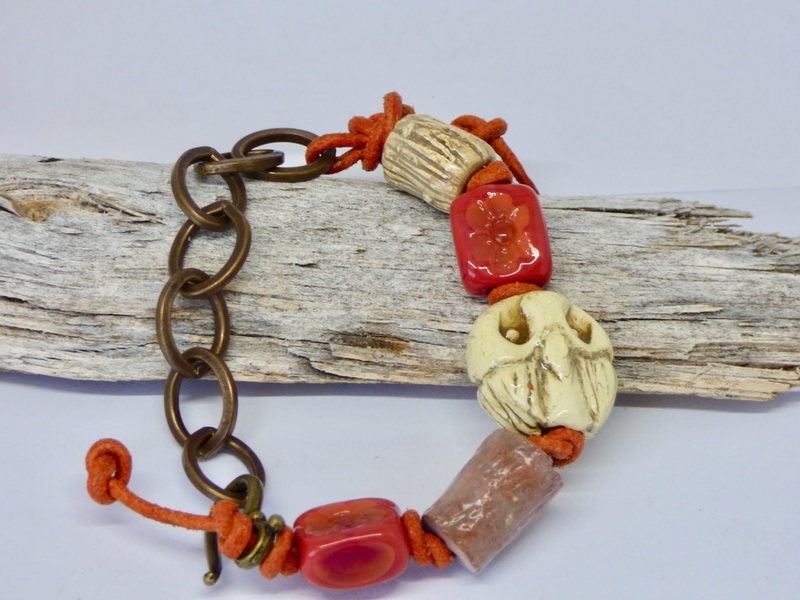 My second creation inspired by birds of prey is this modern owl bracelet with a chunky chain and orange leather combined with art beads in reddish orange, beige and brown beads. 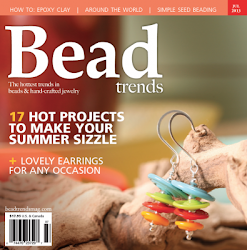 The red brown lamp work beads are by artisan Susan Kennedy. Ceramic owl focal and other handmade beads are by artist Sandra Sapienza. Grab a hot beverage and enjoy seeing what everyone else was inspired to write. Thank you Cathy for hosting challenge. I had the opportunity to go to the Coconut Grove Arts Festival 2019 which is held in the Coconut Grove neighborhood of Miami, Florida. This is the first time I had gone to an arts festival of this size. I have spent lots of time at arts festivals in my tiny state of Delaware over the past decade both as a shopper and retail vendor of jewelry and handmade cards. 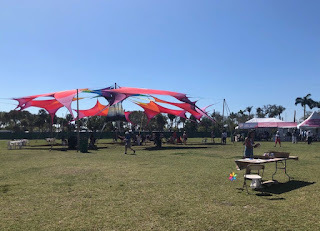 I was anxious to see what this festival was all about. Plus, the setting is a gorgeous mile of Biscayne Bay’s coastline. 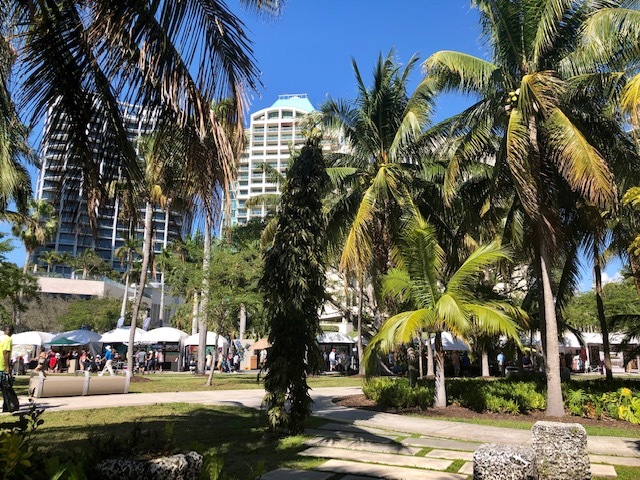 The festival features 360 international artists selected by a jury in mediums ranging from painting to photography, mixed media, jewelry, sculpture and other forms. 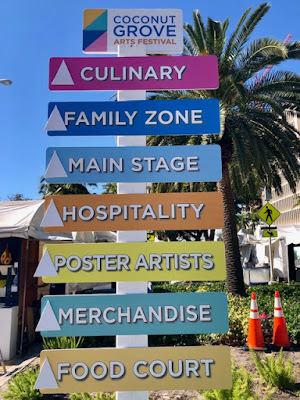 The festival also includes culinary arts, entertainment and family activities. Art lovers can wander from stand to stand in a gorgeous alfresco environment where artists showcase everything from digital art, fiber, glass, clay and metal work. You can also enjoy stands of tropical plants. The orchids were especially beautiful. 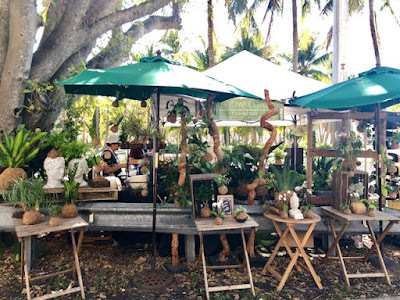 I paid special attention not only to the handmade jewelry there as well as how it was displayed. 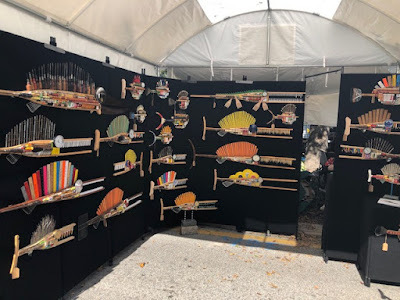 I am always looking for new ways to display my jewelry at art shows. I thought that this booth was unique. It certainly was new to me. I love how the artisan repurposed old fire extinguishers. You can see some of the white exhibit tents filled with arts in the background. 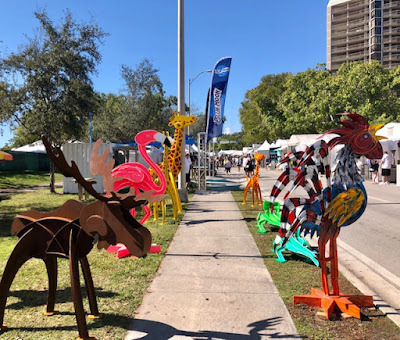 Don't you just love the metal animals lined up on the side walk! 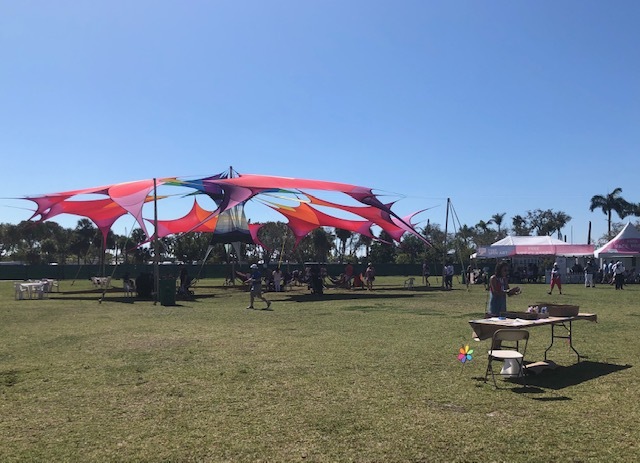 The festival was kid-friendly with a Family Zone in Regatta Park packed with activities, crafts and entertainment for the whole family. All in all, an enjoyable day and festival! What are your thoughts? There are two things that I like to do in the mornings especially in February. I like to watch the local Miami weather station and Al Roker's weather forecast on the NBC Today Show. Why? 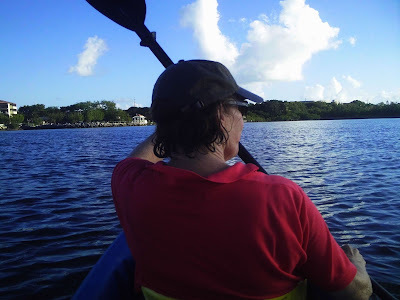 I live outside Miami in the Keys in the Winter. 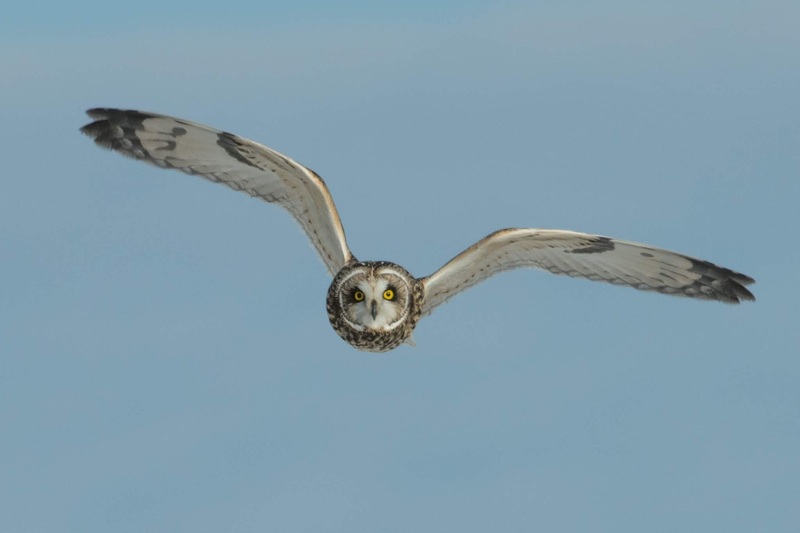 We have to be concerned about wind events like tornados in the winter. I watch the NBC Today Show weather out of a long addiction to it and because I have friends and relatives all over the place. I like to see what the weather is in their areas especially during storms. 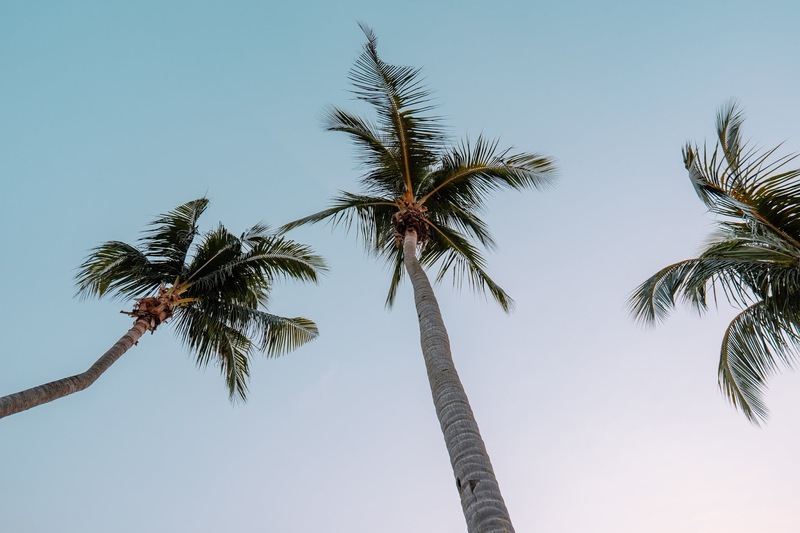 Another reason to know a lot about the weather when you are in Florida in February is that this is a peak time for visitors from the cold and snowy spots like Canada, Ohio, Michigan, Wisconsin, Minnesota, Vermont, Maine and the list of goes on. Weather is a common topic that unites conversations everywhere. It is a little embarrassing to be from a middle Atlantic state. Delaware has had a cold and wet month, but there is no comparison to some of the other places in the country. From my vantage point in Florida, I do enjoy looking at snow, frost, and ice in a digital format only. 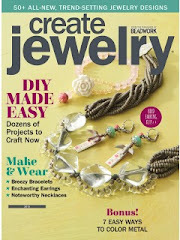 February's We're All Ears Challenge is devoted to nature's icy beauty by creating FROZEN earrings! 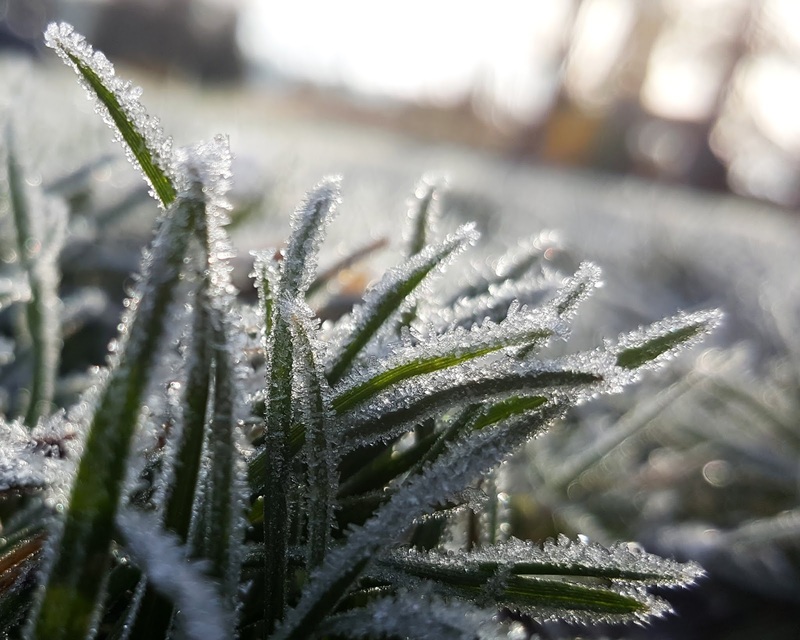 Most of us are familiar with the first frost of the season. For many it is in end of allergy season, time to get warm clothes out of storage. The earrings feature natural kyanite rondels in a wonderful multi blue green shade which reminds me of frost. 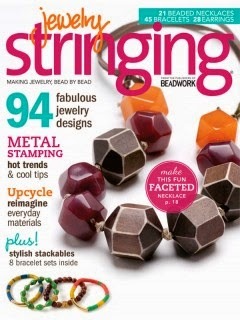 I surrounded the gemstones with arabesque shaped sterling silver frames which hang from sterling silver ear wires. 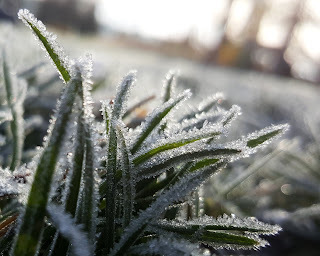 The sterling silver mimics the sparkle in the frost. These make classic earrings for everyday wear. They are available for purchase HERE. Glacier's are snowy and icy spots that many of us haven't seen or if climate change continues the way we are headed, we won't see too many of them in the future. 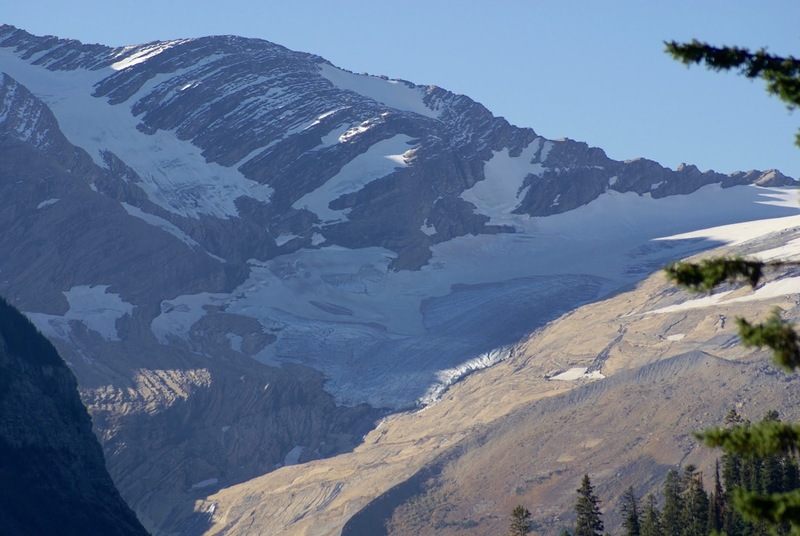 For example, based on current trends, glacier recession models predict that by 2030, Glacier National Park will be without active glaciers (i.e. those large enough to be moving). I choose to focus my next pair of earrings on something more positive. 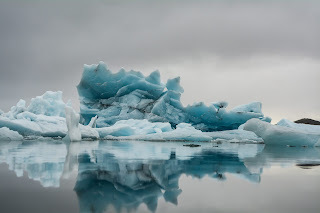 This photo is what I imagine I will find when I go to Alaska. I hope to get this trip off the ground in the next few years. I want to see glaciers there. 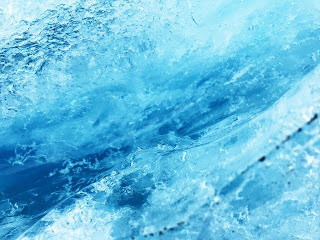 In my mind, the glaciers will be a beautiful blue and clean white. I decided some turquoise and freshwater pearls captured the colors of this glacier and created this pair of earrings. Turquoise and freshwater white coin pearls are combined with sterling silver and attached to sterling ear wires. 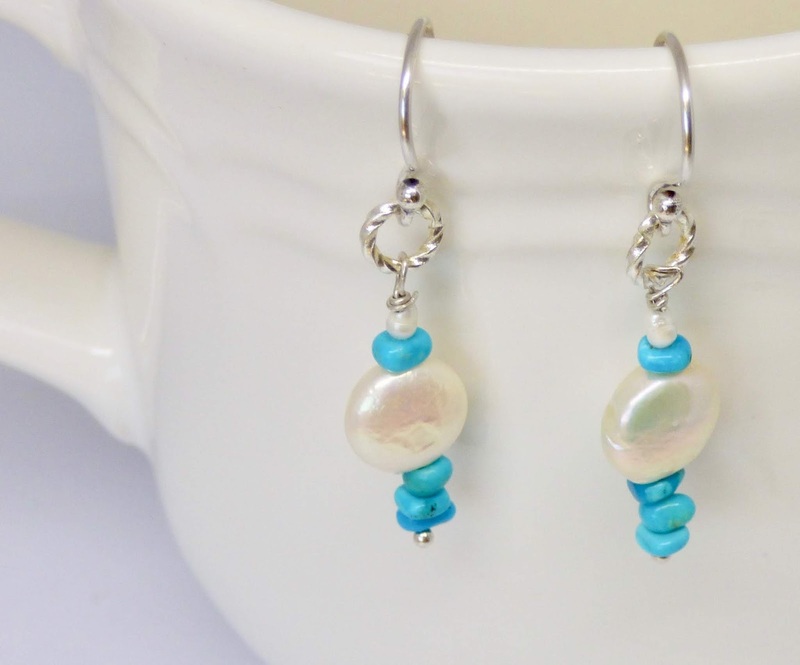 This pair of turquoise and freshwater coin pearl dangles are one of a kind. On an earlier trip to the southwest, I noticed white pearl and combined with turquoise in all shapes and sizes. 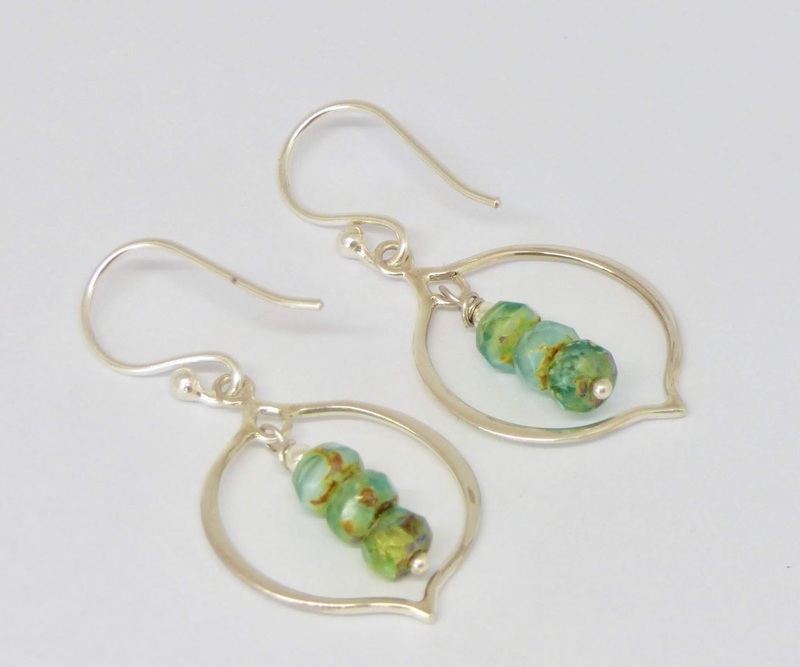 I fell in love with the combination and picked up the high quality turquoise that I used in these earrings there. I always have nice pearls on hand! Stay warm + be safe! 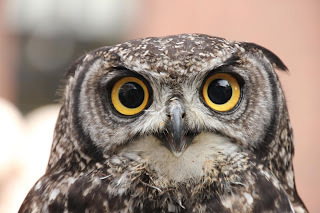 Now hop on over to this month's post to see what others created. 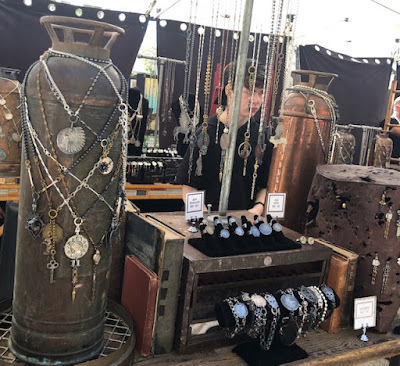 I have used leather in my jewelry before but there are so many projects and kinds of leather to consider when you want to utilize or expand your leather crafting skills. 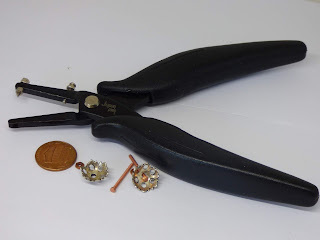 In a previous blog I discussed the challenge of picking out the leather and color as well as showed how I have added leather to my collection of handmade earrings. 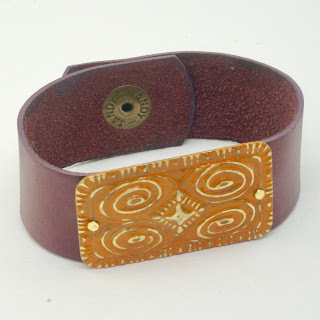 As with leather earrings, I have challenged myself to learn some new ways to incorporate leather into my bracelets. I made this leather bracelet last year. This bracelet has maroon leather with an orange boho style, brass rectangle in the center that I made. The rectangle is natural brass which I applied patina and sealant to. The soft maroon leather provides a color contrast with the orange rectangle. I used micro screws and nuts to attach the metal to the leather. The leather I used is 3 mm wide, approximately 1 mm thick. It has a simple snap closure. 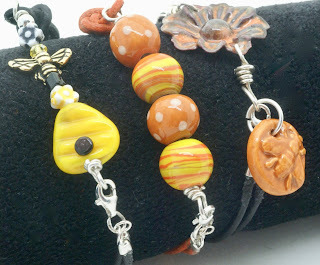 This is a fun trio of leather cord bracelets in orange, yellow and black with very cute bee and beehive beads. 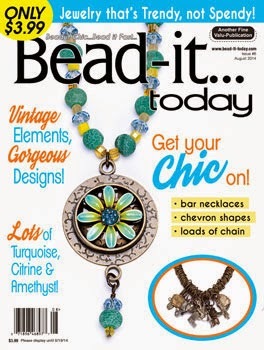 Ceramic bee charms, artisan enameled floral bead, and lamp work beehive beads make this a piece of art jewelry with a story to tell. Making bracelets can be a challenge to begin with. There is the necessity to size the bracelet correctly which can range from easy to maddening. Personally, I love to have any quick easy design that allows for flexibility in length. I found a few styles of leather bracelets that are quick to make and size easily. 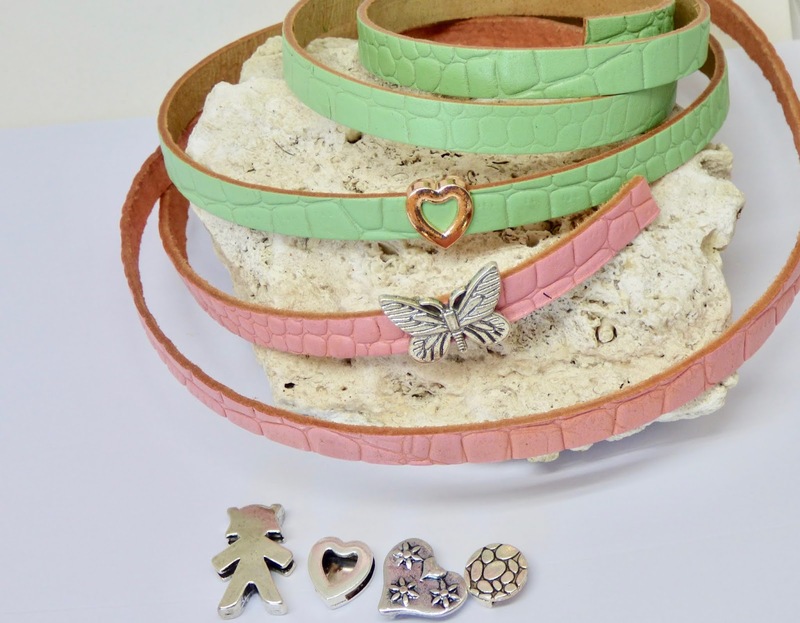 I recently obtained some leather samples from Sun Enterprise so I decided this was a perfect time to create some leather bracelets in another kind of design. 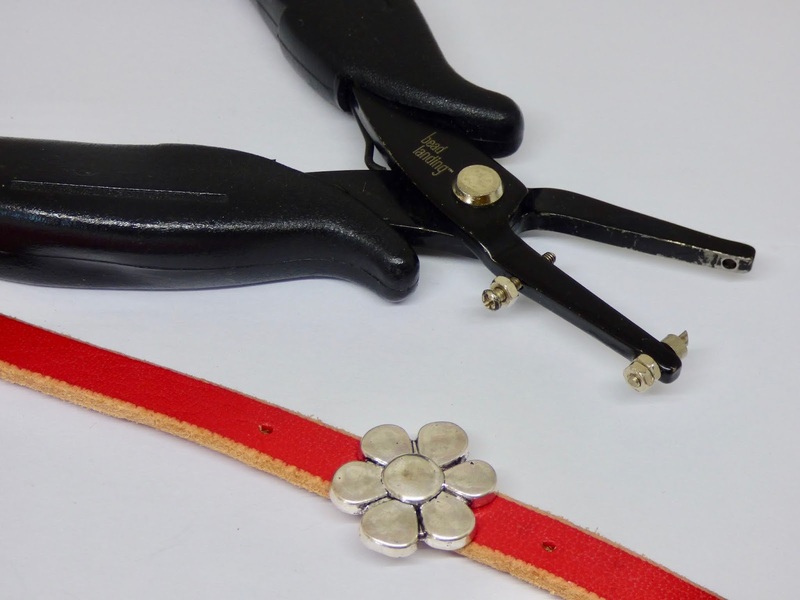 This time I am designing leather bracelets with magnetic clasps. I have never worked with them before. Sun Enterprises is a leading manufacturer and supplier of leather, locks, silk, and jewelry components. They are based in The Netherlands, ship goods across 55 countries, and work extensively with jewelry designers, artisans, jewelry makers, goldsmiths , wholesalers and hobby stores. I was amazed by their huge collection of leathers and locks. I revisited their online catalog for ideas and to look at their hardware. Super Glue is the key to attaching the magnetic clasps that I used with the leather. 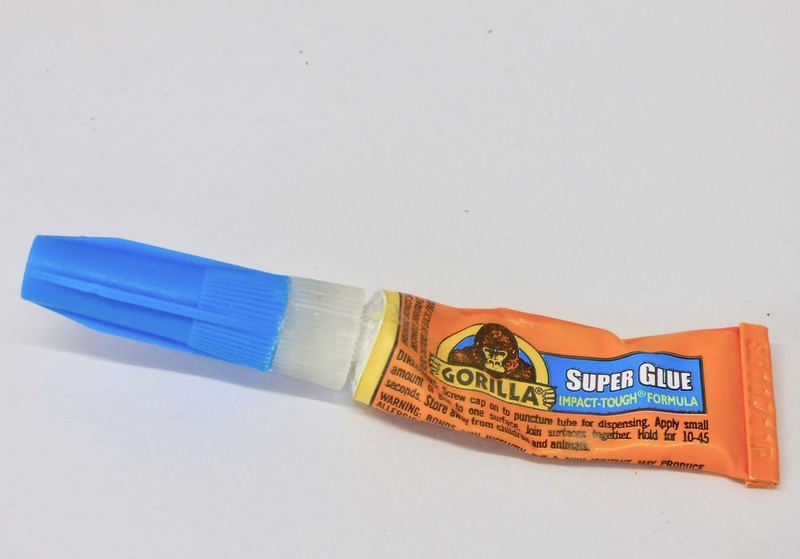 I was dubious that the glue would be strong enough to satisfy me. I tend to over build my jewelry because I don't want a customer to ever tell me something I made fell apart! These magnetic clasps add lots of style to the bracelets as well as being very secure and easy to attach with Super Glue. For my first bracelet, I made a triple wrap bracelet by combining a rose gold slider in the shape of a heart with mint green Italian 10 mm. flat Italian leather. 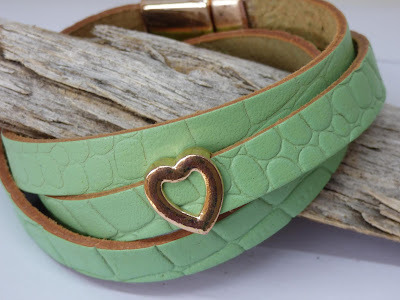 The color of this green leather just makes me happy! I used rose gold magnetic clasp MGL-271 for 10x2.5 mm leather from Sun Enterprise. The key to understanding how to select a clasp that matches onto the end of the leather is to use the width of the leather as your starting point. It sounds easy enough, but I struggled. I would be much more comfortable selecting clasps if I could physically fit them together which is not an option on the Internet. For my next bracelet, I wanted to add to the basic design. To do that, I need my leather punching tool, a couple of micro screw sets, and large sterling silver bead caps. I centered the floral slider on the leather and then punched a hole to the left and right of the flower. I attached the micro screws to the sterling bead caps and nuts. After tightening the nuts I cut off the excess length of screws. I hammered the nuts in place to secure them. This bracelet called for a silver magnetic clasp just like the one used in the previous bracelet. It paired with 10x2.5 mm leather once again. The only difference is the metal color. 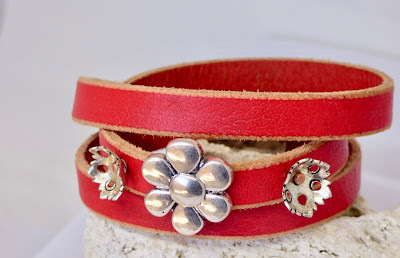 I think you can agree that this triple wrap red leather bracelet with the floral design and color of this leather can add lots of personal style to your favorite outfits. For my next bracelet, I designed a single strand leather bracelet. Once again I used 10 mm. flat Italian leather. This leather reminded me of tree bark. 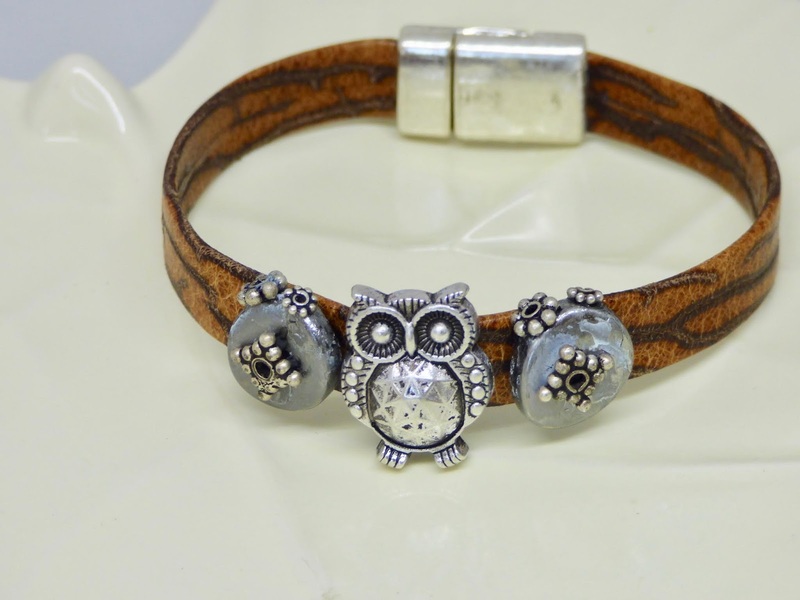 I love owls so I couldn't resist an owl slider that seemed a natural fit with the leather. Once again, I used a silver magnetic clasp, but the difference is that it is sized for 10x2.3 mm leather. The leather is thinner so the clasp needs to designed for a thinner leather. To put my spin on the bracelet I glued metal spacers to two beads that I had in my stash and then glued the beads to the leather. As long as I had Super Glue out I thought I would put it to use. It worked great and I love the fun look it adds. For a single simple leather bracelet with leather, a magnetic lock and a bead, it takes no longer than 10 - 15 minutes. Obviously, it takes longer to make more complex designs. I love that there is no limit to creativity with leather. Comments are welcome!